Acer x freemanii 'Autumn Blaze' arguably has the best fiery autumn colour of all Maple trees suited to the British climate. The attractive, deeply indented yellow-green spring foliage turns green in summer before the vibrant red, orange and yellow autumn colours appear. 'Autumn Blaze' also boasts silvery-grey bark that contrasts wonderfully with the foliage. A popular larger Maple tree with an attractive oval-head, Acer freemanii 'Autumn Blaze' is fairly vigorous and will reach 7 x 4 metres in 20 years. Also known as Acer freemanii Jeffersred or Freeman Maple, it is a natural hybrid that has the autumn beauty of Acer rubrum and toughness of Acer saccharinum. 'Autumn Blaze' holds the RHS Award of Garden Merit and grows in either full sun or partial shade. Our pot grown Freeman Maple trees can be planted at any time of the year and can be positioned in North, South, East or West facing sites. Remove weeds and grass within a metre of your desired planting hole, then dig a square hole as deep as the root mass and roughly 2x as wide. To help the tree establish more effectively, sprinkle root grow in the hole. Remove the pot, gently loosen the roots and place into the planting hole. Mix 50% of the original soil with 50% compost, fill in the hole and firm around gently. Avoid banking the soil up around the collar of the tree. 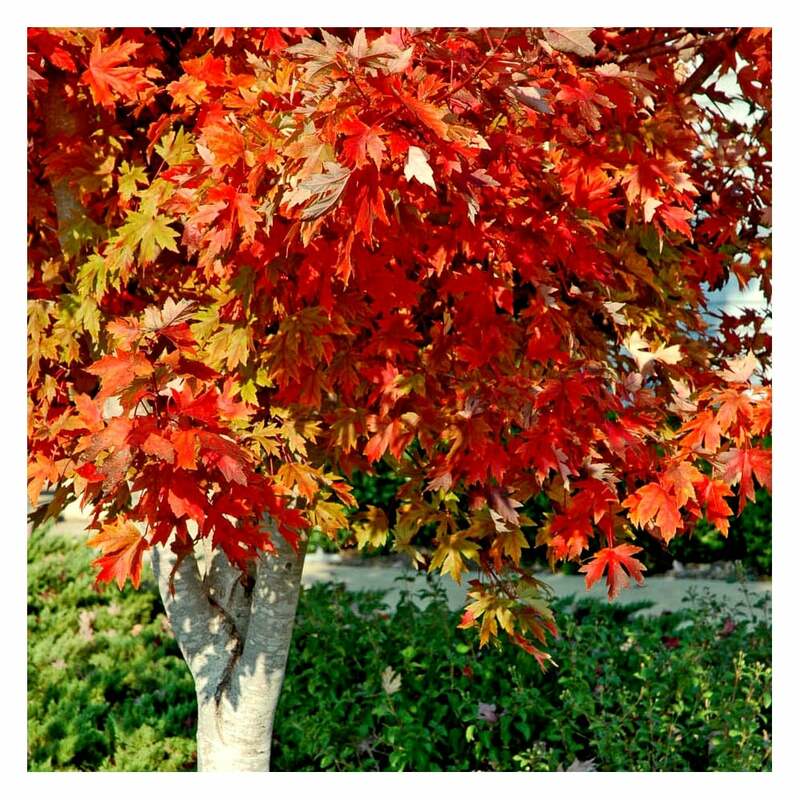 We recommend planting Autumn Blaze Freeman Maple trees with a staking kit. For single stakes, knock the stake in at an angle and use a buckle tie with a spacer to prevent chaffing. For more advice, visit the help section. If you’re planting Freeman Maple trees in spring or summer, water well for the first few months. Increase watering if there are extended periods of hot or dry weather. If planting in autumn, you may only need to water a little. Freeman Maple trees do not require a lot of pruning. Remove any damaged or diseased branches when the tree is in leaf or just after leaf fall. This will prevent bleeding, which although it is not detrimental, can look unsightly. When pruning, make sure to maintain an even framework, step back and assess your work.